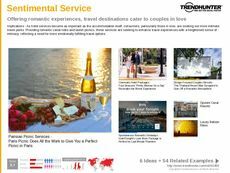 Find Better Ideas, Faster ® with a custom hotel room trend report, our PRO Dashboard and 80+ categories of premium trend reports. The Hotel Room Trend Report is an expansive look into the ever-evolving hospitality industry. This report will focus on hotel room innovations and will expand upon the various technological capabilities, as well as the much-improved amenities and services that modern hotels now offer to their guests. 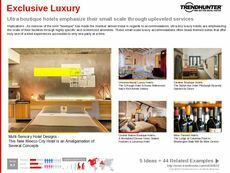 This report will filter through examples of app-connected hotel rooms, room service innovations, luxury hotel rooms, budget-friendly accommodations and themed hotel experiences. This report is geared towards professionals in the hotel industry; executives, research and development personnel, interior designers, advertisers and marketers. 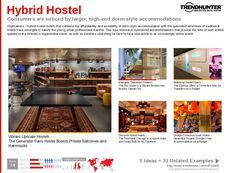 Trend Hunter's data-driven research provides readers with a myriad of examples and highlights pertinent insight regarding the types of hotel rooms that consumers are gravitating towards. The Hotel Room Trend Report shows how hotels have evolved in recent years. Use our collection of trends to kickstart innovation within your team, and map out your next hotel room venture.